Wall of Honor at the entrance to the Municipal Services Center, 3600 Tremont Road. The 2017 inductee - John W. Dunkel. This is part of the display at the 2017 induction ceremony. Each year, a former Upper Arlington resident who brought honor and recognition to our community is selected for the Wall of Honor, with a memorial plaque installed on the plaza at the Municipal Services Center. 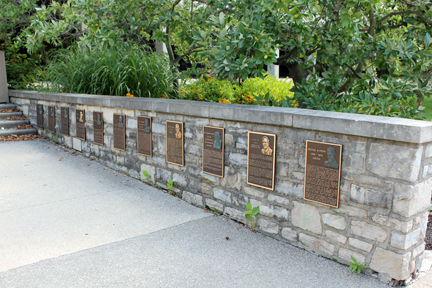 A joint project of the Upper Arlington Historical Society and the City of Upper Arlington, the Wall of Honor has celebrated many worthy citizens since its inception in 1990. The deceased resident must have lived in Upper Arlington at some point in his or her lifetime, and must be outstanding in achievement in the arts, professions, politics, science, education, sports, religion, commerce, philanthropy, public service, or have a reputation that brings honor to the community, or personal commitment and service to the community, or has had a lasting effect for the good of the community. If you know of a suitable candidate for inclusion on the Wall of Honor, we invite you to complete a nomination form and return it by Friday, January 12, 2018. The 2018 recipient will be announced in February, with an induction ceremony scheduled for Sunday, May 20, 2018.